It's no secret that I love books - I think my two little people have so many books they could easily rival the local library's children's area! I started reading to Blake and Maegan when they were still bumps! 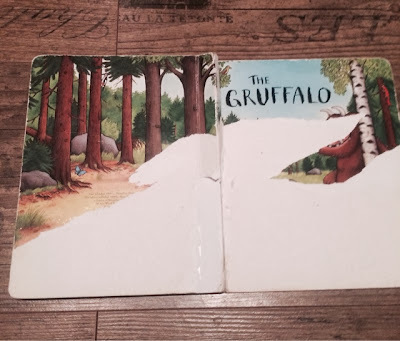 The Gruffalo is our most special book - I've been reading it since 2009 when my first born was just a bump and it's still a firm favourite for both of my children. Both my husband and I can recite The Gruffalo and it's always one of the first things we pack on a long journey along with favourite toys. My youngest has started to occupy the stairs when she's filling her nappy and politely requests to be left alone while she's busy and comically often takes a book to read with her! She's literally in my bad books today though! Whilst in her "busy" moment - she's peeled and ripped the cover from our most precious book :( - I'm sentimental (and border on hoarder) so I was rather tearful when she showed me that she'd managed more than a number two. It was always my intension for this book to become a keepsake. uh-oh little miss. I know it's not the same one, but we have a spare copy of The Gruffalo (paperback) if you're in need of a replacement.